Microsoft Azure training in Chennai at Credo Systemz is preferred by professionals and beginners to learn this enterprise-grade cloud computing platform. This cloud computing platform is designed by Microsoft using this you can build, test, deploy even manage application globally. The Azure cloud platform is also listed down in the top using cloud service platform after its initial release on 2010, We have trained and certified nearly 250+ candidates in our Azure training Center in Velachery, OMR Chennai. As an individual, it is important to choose the best Azure training in Chennai to get the complete hands-on knowledge of this technology. 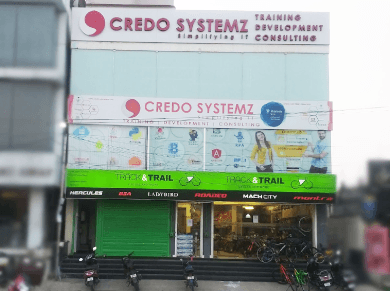 We at Credo Systemz provides the complete hands-on Microsoft Azure training course with real-time projects and case studies, also referred as the best Azure training center in Chennai by our alumni in social media like Google, Facebook and Quora reviews. Microsoft Azure is an open Cloud Computing platform which is initially released in the February 2010 by Microsoft Corporation. This Microsoft cloud computing service provides nearly 600 cloud services in their website which is listed under Software as a Service (SaaS), Platform as a Service (PaaS) and Infrastructure as a Service (IaaS) as like Amazon Web Services. The important benefit here is it supports different programming languages so you need to worry about learning this cloud platform. Our Microsoft Azure certification course helps you to learn this trending Cloud Computing services practically and professionally. Microsoft Azure Cloud Computing platform is first been released in the name of Windows Azure which is later renamed as Microsoft Azure in 2014. This Cloud Computing Technology is transforming the business across the world by providing different services and supports such as databases, storage, programming language, tools even operating systems. Benefits of Learning Microsoft Azure? Microsoft Azure cloud service platform is one of the popular cloud service providers like Amazon AWS. The latest report of Microsoft states that Azure has more than 100 services in different types such as Machine Learning, DevOps, Internet of Things, Management, Apps, Networking and more. Learning Microsoft Azure professionally from experts in Credo Systemz will help you land up in a large number of the job market.Microsoft ecosystem and Cloud joins together to make nearly 63,400 jobs opportunities in the upcoming year according to their latest report. Become an expert in cloud computing concepts. Depth understanding of Microsoft Azure and good hands-on experience in Azure Cloud services. Knowledge in Azure DevOps and continues Integration, Delivery, Deployment. Overall understanding of Azure architecture and get upgradable skills in design principle. Real-time practice in Azure storage. Get professional knowledge to create Azure web Apps. Complete knowledge to crack your Microsoft Azure certification. Detailed instructor led sessions to help you become a proficient Expert in Azure. Build a Azure professional portfolio by working on hands on assignments and projects. Lifetime access to downloadable Azure course materials, interview questions and project resources. How can I book for a Demo session? Easy! You can contact us easily to book your Azure demo session to discuss with our consultant according to your flexible timing. Do your provide assistance to get Microsoft Azure Certification? Practical project based training program. 100% Placement assistance & Job oriented training approach which helps you to get top job opportunities. Real time practical study with case studies and live project scenarios. Mock interviews, Practical assignments, Resume building guidance and more amazing features to the trainees. First thing to remember, Credo Systemz is an expert in providing the professional classroom, corporate and online training program experienced for nearly 6 years. 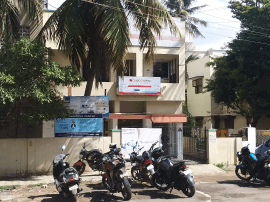 Important to realize our Azure training centre in Chennai is ranked as No.1 from Yet5, Sulekha and referred most in Google review & Quora reviews. In addition to our Azure classroom training, you can join for Azure Cloud, Azure admin and Azure DevOps training in Chennai, Velachery and OMR. Most importantly the training will be handled down by Microsoft certified trainers with real time projects and case studies. Must be remembered the Azure certification course will be handled with real-time projects and case studies which makes you an expert in this technology. Provided that, you will be getting 100% placement & Microsoft certification assistance in this Azure training in Chennai itself. To point out the training program starts from complete scratch proceeds with the hands-on approach to meet all the latest industry standards. To be sure Azure training in our institute is handled with real-time case studies and live project scenarios. Most importantly the training will be carried out by Cloud Computing experts who all are nearly 10+ years of experience in this technology. In general our institute is recommended as the Best Azure training institute in Chennai to get certified. Our Azure course in Chennai is particularly designed by experts to make a beginner into a professional in this technology. On successfully completing the Microsoft Azure training program in our institute you will interview ready with all the required skill set and hands-on experience. You can easily crack the Azure interview using the below interview questions and answers. Microsoft Azure Certification training in our institute is completely focused on enhancing the skill set of an individual, to clear the Microsoft Certification easily. Our project oriented training program which combines with assignments, real time case studies and scenarios, mock interview and certifications exams at the end guides the trainees to be a professional Azure developer.